The purpose of this article is to share what garden clubs and other organizations have done to put together a garden tour and, therefore, make it easier for others to do the same without having to reinvent processes. I welcome any input on what is presented here for I'm sure there's something I've either forgotten or there's more information about a topic that could be added. I hope that this smooths the way for those who want to give a garden tour, but don't know where to start or feel overwhelmed with the prospect of what needs to be done. Good luck! Raise funds for a worthy cause. I've seen thousands of dollars raised for homeless shelters, scholarships for high school students, meals for those in need, community plant projects, and the like. Bring the community together. It's an opportunity for people in and outside the community to socialize and get to know one another better through a common interest in gardens. Encourage others to create their own gardens. Seeing what other homeowners have done with their property can inspire the reluctant gardener to try out new ideas. In your organization, it can bring people to work together who otherwise would not have a reason to interact. When I interviewed organizers of several garden tours for this article, they came with a large notebook divided into sections covering all aspects of organizing a garden tour. So for the person in charge of organizing the garden tour, I highly recommend compiling a notebook first before meeting with a committee. Look at the following sections and start putting together notes on what you already know, such as where you can have tickets and brochures printed, and notes on what you need to find out, such as where to advertise your tour. Also, compile a timeline in two-week segments on which you mark various deadlines, such as submitting a notice to a local newspaper about the tour, as well as tasks to be completed and by whom. In the advertising section, start collecting ads and articles created for your tour each year. In the brochure section, collect names of sponsors to be solicited for your garden tour. The people I interviewed were very detail oriented and with good reason. A garden tour only looks seamless in its organization and execution when all the bases are covered. That means there are one or two people who are constantly checking with others on the committee to make sure tasks are being completed and deadlines are being met. It truly is the sort of commitment where you wake up in the middle of the night and think of something you need to check on the next day. You're involved completely. But the reward is in seeing the event come off smoothly and watching visitors enjoy what you and your volunteers have made possible as well as raising money for a worthy cause. To give you an idea of the process, the following are the main steps involved in organizing a garden tour. Each of these steps is described in detail in the following sections. Put together a committee to work on the garden tour. Each member will be given specific tasks to complete. Ideally, you'll need around ten people to organize and set up the tour. You'll also need at least ten volunteers to be at the gardens the day(s) of the tour. Plan a date(s) and hours for the tour, keeping in mind when gardens look their best and avoiding conflicts with other events, such as festivals or graduations. Determine the number of gardens and select the gardens. Gather suggestions for gardens from people you know. You may want to visit the gardens the summer or fall before. Approach homeowners about having their gardens on the tour and maintain contact with them throughout the process. Optionally, solicit artists and/or musicians to perform at specific gardens. 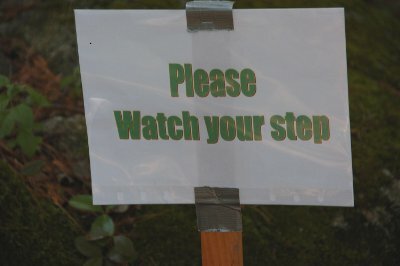 Cover liability issues, such as injuries while visiting the gardens. Create tickets and a brochure with a map. Price and sell tickets. Sell the tickets through local retailers and organizations and possibly through your organization's website or a website created specifically to advertise and sell tickets for your garden tour. Advertise the tour through local newspapers, magazines, newsletters as well as local television and radio stations. 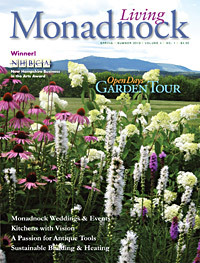 Also, advertise online through your organization's website as well as other websites, such as Garden Tours New England! 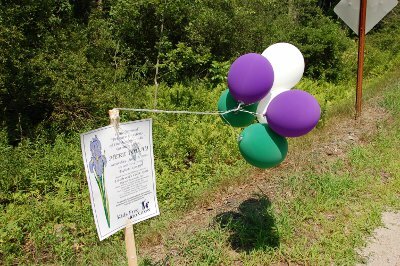 Create and place signs at each garden and possibly along the roads leading to the gardens. Organize a schedule of volunteers who will be at each garden on the day(s) of the tour. Provide refreshments and other items for each garden. Hold regular meetings before the tour and one after. As the organizer, you probably have a good idea of some of the people who would be the best fit for the tasks involved. You can also introduce the project at your organization's next meeting and ask for volunteers. If you need to look to the public for help, you can place a notice in your local newspapers or newsletters. You will want at least two people for each task, depending on the scope of the tour. As you go through the following sections, you will be able to calculate exactly which tasks need to be completed and how many people will be required to do them. Most garden tours take place on a single day. However, a quarter of the garden tours I've listed on my website took place across multiple days. About half of those multiple day tours offered viewing on Friday and Saturday, while the other half were on Saturday and Sunday. A rare one went from Friday to Sunday. When deciding on date(s), check for conflicts with other events, such as other garden tours or festivals in the area. Check calendars from previous years. You can do this easily on the Garden Tours New England website by entering a range of dates on the Garden Tours and Events page to see what tours were running during a specific time period. If planning for a June garden tour, check with local schools for graduation conflicts. Then the other decision is the hours of the tour. After going through all the garden tour listings on this website, the most popular time is 10 a.m. to 4 p.m.. I think the top consideration here are the number of gardens and the proximity of the gardens to each other. When you start thinking of organizing your garden tour, you may already have some gardens in mind. You can also get suggestions for gardens from committee members, members of your organization, friends, and anyone else you can think of. At meetings of your organization or other community meetings, you can ask people to consider offering their gardens for the tour or offer suggestions for gardens they've admired. Most garden tours require a vehicle and from the listings I've surveyed, the average number of gardens for a 10 a.m. to 4 p.m. time period is about six. However, I've seen as many as twelve gardens advertised for a tour requiring a vehicle. Having gone on numerous garden tours myself, I would say that sometimes more is not better. It can be difficult to see that many gardens in six hours and be able to stop for lunch or even a bathroom break! So for a six hour time period and depending on the distances and size of the gardens, my opinion is that six to eight gardens is about right. For garden tours where the gardens are fairly close together in a small community or a region of a city and visitors can walk between gardens, then perhaps as many as ten or twelve gardens are feasible depending on the size of the gardens. This is something you can gauge by walking or driving between gardens and figuring out how many gardens will work best. Other considerations in terms of time are giving the homeowners and volunteers time to view other gardens and giving volunteers enough time to clean up and store items. Also, you can start out small if this is your organization's first garden tour. You could do a half day tour with just three gardens. Another consideration in selecting gardens is variety. It's good to have a mix of gardens such as backyard pocket gardens, suburban gardens, large estate gardens, gardens that have a wonderful view, gardens with waterfalls and ponds, gardens with container plantings, and so on. Every garden has a personality so that even two suburban gardens can be very different depending on the terrain, the amount of sun or shade, and the owner's preferences and creativity. You could also have a theme to the tour. For example, in Concord, New Hampshire, the theme for their 2012 garden tour was green energy. This tour featured homes and gardens that have solar, wind, or geothermal power, and offered lectures at various homes on this topic. In a city, you can focus a tour on a region of the city. In Portsmouth, New Hampshire the annual pocket garden tour is generally focused on one area of the city; this makes it possible for people to walk between gardens if they choose. When to visit prospective gardens is another question. You can go around to various gardens the year before the tour or if you do a tour every year, visit gardens right after the current year's tour. Some organizations visit in the summer and others survey possible gardens in the fall. After you have a list of possible gardens, then the next step is to contact the homeowners. You can either send an email, call, or send a letter. Once you have a response, you will want to establish a rapport with the homeowners and address any concerns. When you talk to the homeowners, you may find that they need some convincing. Some may think their garden is not good enough. Others may have concerns about people coming to their house. It's best to have two people go together to talk to the homeowner to convince or to reassure them. You can point out the features that make their garden special and that will bring enjoyment to those who visit. If the homeowner says they will be out of town, you can offer to have volunteers take care of everything that needs to be done in terms of setting up, being present during the tour, and then cleaning up. Make them aware that it can be stressful preparing their garden for the tour, but that your organization can provide volunteers to help with weeding, setting up tables and the like. After they have agreed to have their garden on the tour, it's important to maintain contact during the planning stage right through to the end of the tour. This may require one or two people. Email is the most efficient way to communicate regularly with homeowners. If that's not possible with some homeowners, then phoning is necessary. They should also be included in committee meetings in the months leading up to the garden tour. To add interest and a unique draw to the tour, consider having artists and/or musicians at specific homes. 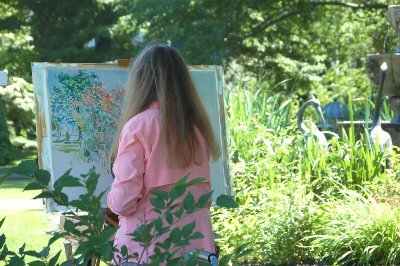 The artists can set up their easels and be painting or drawing a garden scene before them (known as plein aire). 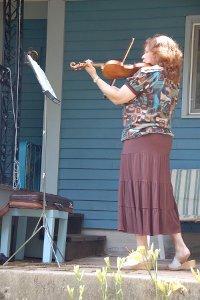 A musician playing an instrument such as the violin or guitar can provide soothing background music as visitors stroll the gardens. 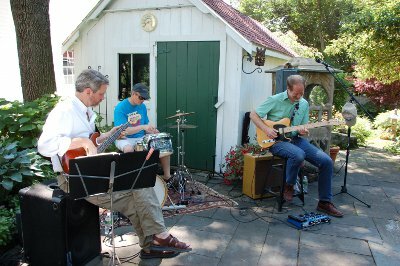 Also, a group of musicians or small band can provide a lively focus of entertainment. One garden club worked with their local historical society to have an auction of the artwork created that day. The proceeds went to the cause they were promoting. To find artists and musicians, start with members of your organization who either are artists or musicians, or know of local artists and musicians. When you scan the entertainment section of your local newspapers, you will often see the same names mentioned throughout the year. Many communities have artist and music organizations that can offer suggestions of members who may be interested in performing. The holder of this ticket assumes all risks associated with the tour of “Beyond the Garden Gate: A Tour of Special Gardens”, including but not limited to stairways, slippery areas, and other hazards. Please be careful! In addition, you can cordon off or place signs warning of unsafe areas, such as steep steps or slopes, to avoid accidents at each garden. Also, volunteers can guide visitors away from those areas. At the outset, discuss liability issues with homeowners making them aware of possible risks, but also assuring them that it is rare that there are any issues or claims. It's a risk that needs to be carefully weighed and considered. Find a person in your organization to design the art for the ticket and brochure. 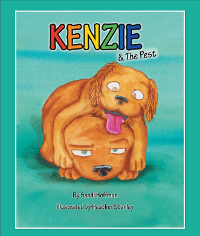 The art also can be used on posters and other advertisements for your garden tour. Businesses that may be interested in advertising in a garden tour brochure include landscapers, nurseries, hardware stores, realtors, local inns and restaurants, and local stores in general. Have a volunteer experienced in publishing brochures use a software program such as Microsoft Word or Publisher to create the brochure and map. For the brochures, you need descriptions of the gardens. You can either have the homeowners write their descriptions or you can have volunteers meet with homeowners to gather information and write the descriptions. In either case, it's good to have a list of questions about the gardens to cover what will be in the descriptions. Generally, the descriptions should be no longer than eight sentences since it's hard to read more than that on a tour. But use your discretion since I have seen brochures that offer a history of older homes on the tour, which visitors might find interesting. It's also a good idea for committee members to save tickets and brochures from other garden tours that they have attended to get an idea of what a good description looks like as well as ideas for the design of the tickets and brochures in general. Drive around to the gardens to figure out the best route for viewing the gardens, tracking miles and time between each. Use software such as Google Maps, SmartDraw, or Maptitude, to create the map of the area with a suggested route for the garden tour. The suggested route helps to manage the amount of traffic at each home. Also, having events such as musical performances or lectures at specific gardens helps to control traffic. Where visitors can go for a bathroom break. In Portsmouth, the organizers arrange with a local church in the garden tour area to open their doors to the public. Also, some homeowners may be willing to have their bathrooms available to visitors. Optionally, suggestions for places to eat in the area, which is helpful for those who are not local. This list is also good for bathroom breaks. Find a person to be responsible for printing the tickets and brochures. Some people know of a company that can do this for them or they have the tickets and brochures printed at a local print shop such as Kinkos. It is important that it looks professional and is of good quality. You may also need people to assemble the brochures. Find a person to design and put up a web page to advertise the tour and to sell tickets. This makes it easier especially for those not in the local area to purchase tickets. You can have the page as part of your organization's website. Set up a Paypal account or other online account to collect payments for tickets and to track the ticket sales. These organizations generally charge $1 per ticket to do this. Usually organizations have two prices for tickets. A cheaper price for buying tickets in advance – figure out the cut off date for this. A higher price for after this date and on the day(s) of the tour. Look at other comparable garden tours to calculate a reasonable cost for tickets. After looking through the garden tours for 2012 on this website, the average cost of tickets was $15 in advance and $20 on the day of the tour. That said, there are tours as high as $75, which are annual fundraisers for an organization in a high income area (i.e. Greenwich, Connecticut). You have to gauge what the market will bear. You know your area, what the average income is, and what you think people are willing to pay. If your tour has been very popular in the past, you may be able to charge more than the average. Also, some tours offer a boxed lunch for an additional cost. Generally, about 15% of the total number of tickets are sold before the day of the tour. 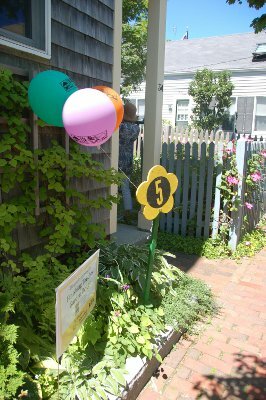 For example, for the Portsmouth Pocket Garden tour, they generally sell around 100 tickets before the tour and anywhere between 700 to 800 tickets the day of the tour. You can have local retailers and organizations, such as libraries, sell tickets for your tour. You will need a volunteer to supply the retailers and organizations with tickets and to visit them regularly to collect the money from ticket sales. In your advertisement, list the retailers and other places where people can buy tickets. Be sure to supply the ticket seller with a small ad about the garden tour that they can put in their window or on their counter. Have someone, such as a bookkeeper, be in charge of the money, credit cards, and checks. Arrange to have Visa and Mastercard available the day of the tour at the main area for selling tickets and distributing brochures and maps. You will need enough money to make change where tickets are sold on the day(s) of the tour. Finally, give free tickets to the gardens' homeowners for them to see the tour. Have gardens open an hour or two later to allow them to see the gardens. Give the homeowners a thank you gift, such as a plant. Besides a web page to advertise and sell tickets, you will need to advertise your garden tour through various medias including print, online, radio, and TV. The goal is to generate community interest in your garden tour. Make a list of publications in which to advertise, such as newspapers, magazines, newsletters (garden clubs), community bulletins. Many offer to list garden tours free of charge. Note how often they come out and a schedule of when you need to submit ads, for example every week for a month. Find out when their deadlines are and plan accordingly. Put ads in your local newspapers as well as those from other areas of the state or region. For example, here in Wilton I would advertise in our two local newspapers, the Monadnock Ledger-Transcript and the Milford Cabinet. I would also advertise in city papers in Nashua, Manchester, Concord, Keene, and Portsmouth. I also might consider the Boston Globe. Put ads in regional magazines. For the New England area, that would be Yankee Magazine, New Hampshire Profile, Down East, and Boston, for example. Send notices to other garden clubs; New Hampshire has about 30 to 35. Look up the Federation of Garden Clubs as well as National Garden Clubs on the web for a listing of clubs in your area. Look into a newspaper or magazine writing a story about your upcoming garden tour. Either take a photo of each of the gardens or have the homeowners send in photos of their gardens to be used in the story, ads, or the brochure. Advertise your garden tour on websites that list local events, such as Yankee Magazine and Garden Tours New England! Also, send emails to garden clubs and other organizations you think may be interested in the surrounding area as well as those farther afield. Advertise on local radio and TV stations – both on their websites and on the air. Find out how far in advance you need to submit info for them to include it in their community announcement segment. For example, with WMUR, a TV station in New Hampshire, you need to submit information about an event six weeks in advance. Look into local shows such as New Hampshire Chronicles that feature stories from around the state. Compile a mailing list of attendees from previous garden tours. Mail a postcard or send an email reminding them of the upcoming tour. This means that at the tables that sell and collect tickets, there should be a sign up sheet for attendees to write their name, address, email address if they wish to be notified in advance. 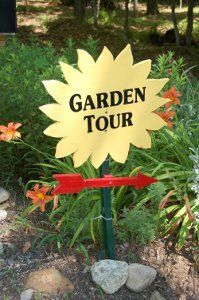 You will need a garden tour sign posted at each home to identify the homes on the tour. Alternatively, you can tie balloons to the mailbox or a post. However, this is only good for one-day tours. Have a volunteer design the sign and have it printed on fabric, which can be hung from a post in front of the house. Or you can construct a sign out of wood. 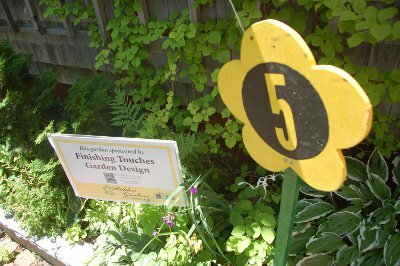 The Munjoy Hill garden tour committee created painted wooden signs in the shape of a daisy with the number of the garden in the center; this was accompanied by a sign designating that particular garden's sponsor. The advantage of signs is that it looks more professional and can be used for years to come. However, if you're not sure if you will have future tours, then just balloons may be best. To provide a base for the signs, you can place them in a flower pot filled with plaster of paris. 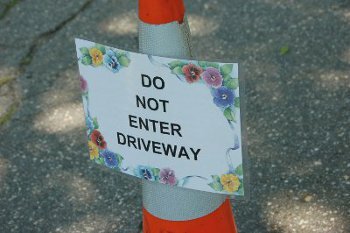 Decide beforehand where the sign will be placed at the home of each garden. On a multiple day tour, take down the sign at the end of each day and put back up the next day. Either the homeowner or a volunteer can do this. 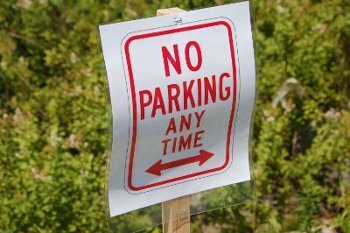 Also, you can have signs to designate where people can park and where they can't. It's helpful to have signs posted along the roads to the gardens to let people know they are going the right way. This is especially important for visitors who are unfamiliar with the area. 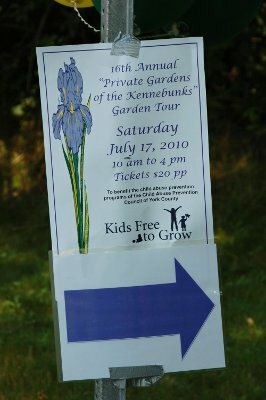 You will need volunteers to create the signs and to post them along the garden tour route. There should be two shifts – one for the morning until noon and the other for the afternoon. Of course, the times of these shifts depend on the hours of your tour. Since there are two shifts that means four volunteers per garden are needed each day. When you meet with volunteers, have them sign up for their preferred shifts and gardens. If the tour is more than a day, they will have to sign up for shifts on the other days of the tour as well. On the last day of the tour, the second shift of volunteers packs up what was delivered, disposes of the garbage, and returns the stuff to the organization on a day that works for the tour organizers, such as the following Monday. Arrange with the homeowners ahead of time about table and chairs; these will need to be supplied if they don't have them. Volunteers at each garden site should be equipped to sell tickets – cash or check only with adequate money for making change. Visa and Mastercard charge cards should only be handled at the main ticket and brochure area at the start of the tour. During the months before the garden tour, members of the committee and garden homeowners should plan to meet at least once a month. The purpose is to make sure deadlines are being met and to discuss any difficulties that come up. It's a chance for committee members to update others on the progress they have made and what's left to do, and to solicit suggestions on ways to tackle problems. Homeowners can let the committee know how their preparations are coming along and if they need volunteers to help. The meetings are generally held during the evening as many people may have day jobs; the meetings are between one and two hours long. But, of course, plan the meetings according to what meets the needs of the members and the homeowners. If people are unable to attend, be sure to communicate through email about the results of the meeting and to have people email about their progress and any difficulties they are having. I didn't think to discuss this with those I interviewed, but it stands to reason that the organizer and committee would want to meet afterward to discuss how they think the garden tour went. Each member should outline difficulties met and possible suggestions for addressing or avoiding problems on future garden tours. Go through each task gathering feedback and ways to improve the process. You could also have a reporter from a local newspaper write about the garden tour. This would have to be arranged before the garden tour so the reporter could attend. Or you could have a volunteer submit an article to the local newspaper about the highlights of the tour. This is especially effective if you plan on having future tours; it gets people to make a mental note to see the garden tour next time whether it be next year or the year after. By the way, you do not have to commit to having a garden tour every year, which can prove to be too much for some organizations. There are plenty of garden clubs and organizations that have a garden tour every other year or every three years. It's whatever works for you. Finally, the post garden tour meeting is a good way to provide closure by thanking those who contributed to the success of the garden tour and hopefully to set the stage for organizing the next tour. It might be nice to have an acknowledgment written for the organization's newsletter, listing the names of the participants and volunteers, thanking them for all their hard work. And an extra step might be for the organizer(s) to write thank you notes to the volunteers. Let all bask in the glow of the garden tour's success! Thank you to the following people who generously gave of their time to meet with me and provided invaluable information that I'm sure exists nowhere else!